Victims of IRA violence have invited New York Mayor Bill de Blasio to meet them after what they described as his "disgusting" and "crass" decision to brand St Patrick's Day 2018 'Gerry Adams Day'. The families told the Belfast Telegraph of their fury at the "insult" after Mr Adams, who has always denied being a member of the IRA, received the honour at a St Patrick's Day breakfast event attended by Taoiseach Leo Varadkar. 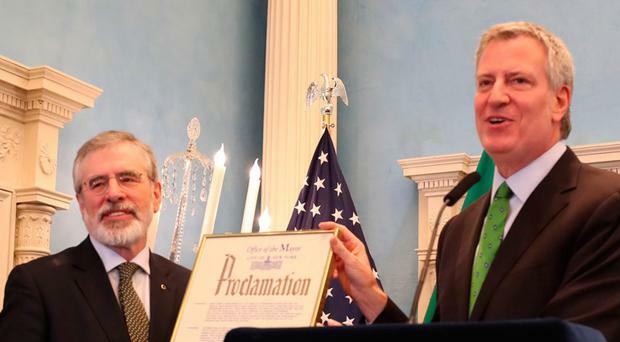 The proclamation read: "I, Bill de Blasio, Mayor of the City of New York, do hereby proclaim March 17 2018 in the city of New York as 'Gerry Adams Day'." Mr de Blasio praised the former Sinn Fein president's "goal of a united Ireland", which he described as "a goal that makes so much sense". Mr Adams also called for the reunification of the island. Mr Varadkar said it was not helpful to call for a united Ireland, and the priority was to get the Stormont Executive back up and running. He pointed out that it was "not our tradition to name days after any particular individual in Ireland", but extended his "congratulations to Gerry" on the "honour being bestowed on him by the city of New York". Outraged victims are now calling on Mr de Blasio to withdraw the honour, and for US President Donald Trump to intervene. Colin Worton (57), whose 24-year-old brother Kenneth was one of 10 Protestant workmen shot dead by the IRA at Kingsmill, and said he was "totally dumbfounded" by the decision. "It's like an April Fool's joke," he said. "You would have thought that the Mayor of the city which experienced 9/11 would be more clued up. It's the same as re-naming July 4 Osama bin Laden Day. "It's silly and stupid, and it retraumatises victims. "That mindless Mayor doesn't understand the hurt felt by victims here. "It's part of the republican effort to rewrite the historical narrative, trying to cast Gerry Adams as some sort of freedom fighter, and they have accepted it unquestioningly." Mr Worton invited Mr de Blasio to meet him and other IRA victims, saying he wanted to "educate" him. "People can celebrate St Patrick's Day, but don't insult us - I am verging on disgust," he added. "I do think that Bill de Blasio should step down." Ann Travers, whose sister Mary was shot dead by the IRA in Belfast as she walked home from Mass, said she had written to Mr de Blasio and Mr Trump demanding the honour be withdrawn. She also plans to write to Mr Varadkar. "St Patrick's Day is a day to celebrate Ireland's patron saint, and to want to change that name for Gerry Adams is crass, ignorant and insulting," she said. "People forget that there are men and women who lost loved ones or are living with life-changing psychological and physical injuries. They are the real heroes. "Gerry Adams should have refused this, as the legacy of the past has not yet been dealt with. "Victims are still suffering and fighting for truth and justice. It's even more disappointing for me that Leo Varadkar was there and he didn't say anything in support or memory of IRA victims. "He should have spoken out for victims, and I hope he will speak out and explain the situation to the New York Mayor." Ms Travers also slammed Mr de Blasio's comments over a united Ireland. "My sister's life, the lives of the thousands of other people killed and the lives of those still undergoing trauma are worth more than not having a border on this island," she said. "Mr de Blasio has validated the republican narrative of the Troubles without querying it. "People were murdered when they were out socialising, working and coming out of their places of worship. That's not a war, that's terrorism. Coming from the Mayor of New York, a city which is full of victims of terrorism, makes this even worse." Ms Travers invited Mr de Blasio and Mr Trump to meet her to discuss victims' views. "Donald Trump says he loves Ireland and he is anti-terrorism, so this is his time to prove it," she said. "I would call on de Blasio or Trump to withdraw this honour for Gerry Adams. "This is an insult and we can't let it lie without responding." Victor Barker, whose 12-year-old son James was killed in the Omagh bomb, described Mr de Blasio's actions as "pretty sad". "I think the Irish people as a whole would be pretty disgusted," he said. Stanley Liggett, who was shot in the head in an IRA attack that claimed the life of his 21-year-old fiancee Jillian Johnston on March 18, 1988, said he "can't believe" Mr de Blasio's comments. "She was only starting out in life when it was taken away and that's why I can't believe that the New York Mayor, or any politician, would have said what he said," he added. "Anyone who saw what I saw or went through what I went through would never say such a thing." UUP MLA Steve Aiken said he hoped that Mr de Blasio would meet victims, and called the proclamation "an attempt to rewrite history". He said: "The presentation of a proclamation to Gerry Adams by the Mayor of New York was a kick in the teeth for the victims of terrorism and brings shame on the office which he holds. "His eulogy of Adams then rubbed their noses in the dirt and has caused further pain and hurt. The fact that he tried to tie St Patrick's Day into it is an insult to the law-abiding majority on these islands who celebrate the day." The Belfast Telegraph contacted Mr de Blasio and Mr Varadkar's offices, but had not received responses at the time of going to press.